This is a script that removes everything from the page except for the game itself (and the nice-looking background). This reduces lag significantly. Before you begin, install uBlock Origin! This step reduces lag quite a bit by itself. 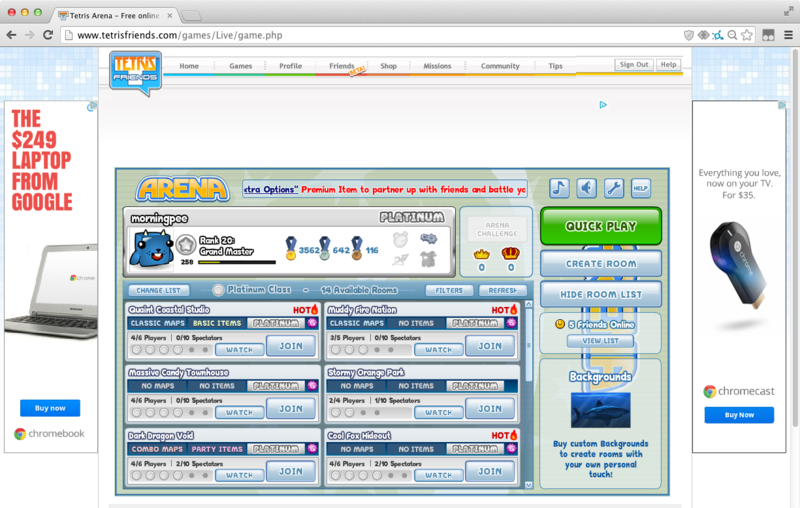 If you have Firefox, download the Minimal Tetris Friends Firefox add-on. If you have Chrome, download the Minimal Tetris Friends Chrome extension. If you have Opera, download the Minimal Tetris Friends Opera add-on. If you have Edge, get Tampermonkey. If you have Safari, get Tampermonkey. Go to this page. A dialog will pop up, click accept, and the script is installed. 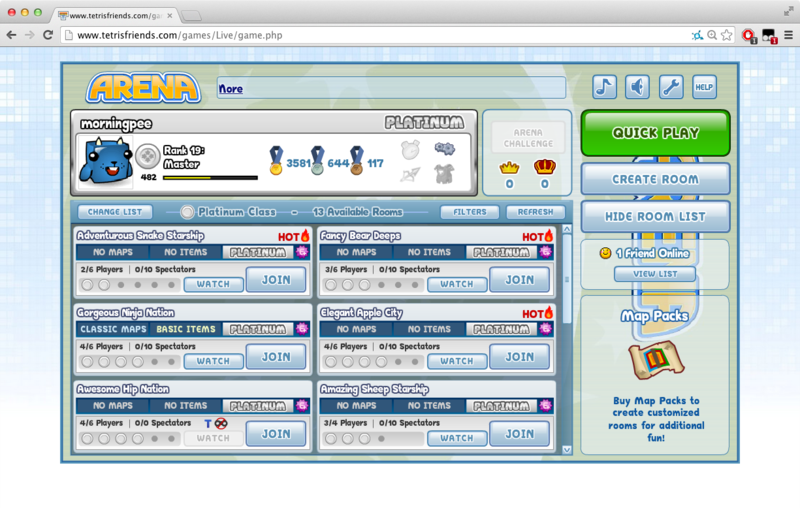 Visit the Tetris Friends Arena, and the script will do the rest. The DAS URL hack does work with this. So anyway, try it out and post results. Intendant, you have a voice that makes me wanna play tetris! then the script works; the Flash object is a little too high, though. I just uploaded a new version. If you install that, it should work now. Still working on the Opera fix. Fixed the extension for Opera, the script should now be running correctly in all browsers. See the first post for links. For anyone who has tried Minimal Tetris Arena, do you think it should also set the Flash quality to low, to reduce lag even further? The version of this script that I use (not the current public version) does do this, and it makes all the games on Tetris Friends run like a dream. However, the "low" Flash quality setting also makes everything look like poop. Thoughts? Yes! I dont care what it looks like as long as its fast! Great work btw! I love it! Okay, I've updated it to set the Flash quality to "low", to decrease lag even further. Also, the Opera extension now works in Opera 18. If you have Chrome, get Tampermonkey. If you have Opera, you can skip this step. Both (2) and (3) are forks of (1), and they claim to have superior performance to (1) in some aspects. How Do You Change The Epic Ultra Low Definition Back To Normal??? How Do I change it back to high definition? Sorry about that. I'm glad you figured it out eventually. If you want a compromise between performance and not-looking-like-poop, try setting the Flash quality to "medium". 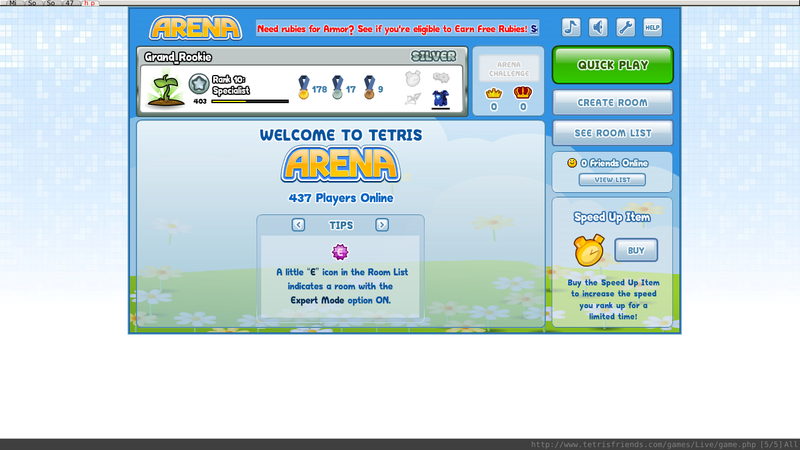 I'm thinking of making Minimal Tetris Arena a fully-fledged browser extension so you can choose page quality as a setting before the page loads. Thanks, I've been looking a userscript manager extension for Opera but couldn't find one. There are no images or CSS left on the page from the original Tetris Friends code. I added the background back in for æsthetics, which shouldn't affect performance. I suppose there are still a few JS listeners still on the page if you don't use AdBlock. I'll do something about that in the next update, thanks for the suggestion.